Some may know him better as Ulysses, but Odysseus was his Greek name, and the name under which he emerged from Greek mythology as one of its greatest heroes. 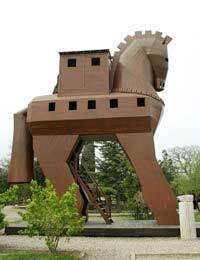 In the company of Hector, Achilles, Ajax and more he fought in the Trojan War, during which he was recognized as the bravest warrior in the fight. But it was his journey home that was fraught with the most peril - and adventure - a ten year long voyage that is the source of one of the greatest adventure tales of all time, the Odyssey. Odysseus knew a fight was coming. When Helen of Sparta was stolen away by Paris of Troy, Odysseus was one of many great leaders sought to come along to retrieve her and fight in the Trojan War. Odysseus, however, did not want to go. A prophecy had been made stating that if he were to go his voyage home would be exceedingly long and dangerous, so Odysseus hatched a plan to dodge the draft. He hitched a horse and a donkey to his plow, causing it to plow unevenly due to the different strengths of the beasts. He also plowed his fields with salt, which would ruin them - other came to watch, starting to believe he was too mad to go to war. One, however, suspected his ruse and placed Odysseus' infant son in the path of the plow. Odysseus avoided running his son over, was deemed sane, and had to go to war. While Odysseus was known for his cunning and wisdom, he was not above reproach. The man who placed Odysseus' son in front of the plow was singled out by the hero as a target, set up, and killed. Later Odysseus would show poor judgment and cause his own worries form prophecy to come to pass. On his voyage home from war Odysseus took refuge in a cave with his men, but the cave was the home of a one eyed Cyclops. Odysseus managed to blind him, and the Cyclops could not even name his enemy, as Odysseus had given the name "Nobody." But when Odysseus sailed away he called his name out to the Cyclops, who then prayed to his father Poseidon for revenge; it was Poseidon who kept Odysseus at sea for ten years, delaying the return home that was prophesied before Odysseus left for the Trojan War. Odysseus finally returned home to Ithaca to find his wife under siege by suitors. He gained assistance from the Greek goddess Athena with advice on how to disperse the suitors and reclaim his home.